Today I’m introducing a new monthly feature post for this blog. 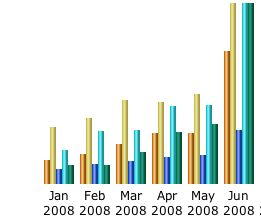 After each month comes to a close I’ll share some statistics about this blog with you. I intend for these posts to be brief but informative for readers and advertisers. Speaking of which, click here if you’d like to purchase a 125 x 125 advertisement on this site. My highest trafficked day was June 18th with 43,827 page-views spread over 7,570 visits. Yup, that was the day I was listed on fark.com for this post about the similarity between John McCain and Colonel Tigh from Battlestar Galactica. This blog is also syndicated via RSS to an average of twenty readers, with a high of 76 readers on June 18th. My facebook profile also pulls a short excerpt of each post and broadcasts it via RSS to my 397 friends. If there are any other statistics anyone would like to see let me know and I’ll add them (if possible). Thanks to everyone for making June my best month yet! You all rock!